The McLaren MP4-29 shown at their launch differed in Rear Wing specification to the one shown in the video's that accompanied the launch. From this it was fairly safe to assume that the physical item was a placeholder and the components used at the first test were actually representative of the true specification. 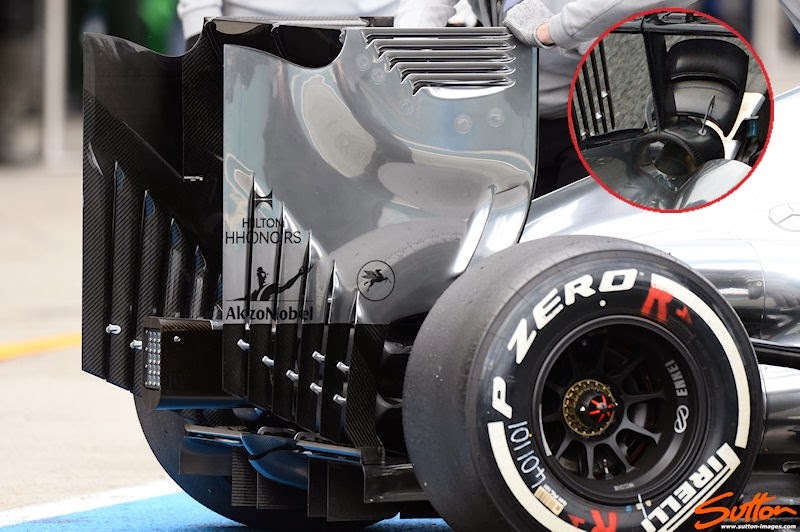 The use of a Y-Lon (inset) to add rigidity to the rear wings structure and surround the exhaust outlet means the team are able to minimise the method in which the rear wing is affixed to the floor of the car. Allowing the team to use a thin fixing point which mirrors the width of the serrations in the endplate aft of it means that too aids in the flow regime. The ever increasing length of the these serrations is aimed at creating an airflow structure that upwashes, in an effort to replicate the Beam Wing's flow structure (the beam wing cannot be used this season). In order to retain the integrity of the endplates the team have placed spars between the serrations that are also shaped to encourage the upward directional flow. The team have also retained the leading edge tyre wake slots used during 2013 but have increased the width of the outer entry point.